Frankymole - I just love that picture of Tara that you have - could it be made available in good quality resolution?!! As I started this line of request, may I also add my thanks - a super picture of my fave Avenger girl! Thanks PURR and Frankymole - you are superstars of the Avengerworld! You have good taste when it comes to Avengers ladies, is all I can say. Aw, thank you--you're too kind. I like finding little bits and pieces, and I like to share. I'm not anywhere near Alan and his ilk, though. Their work on the Keel episodes is absolute genius. The big German set arrived today. Is this the right set? I'm not really sure what it should look like, I've only seen the individual sets before. 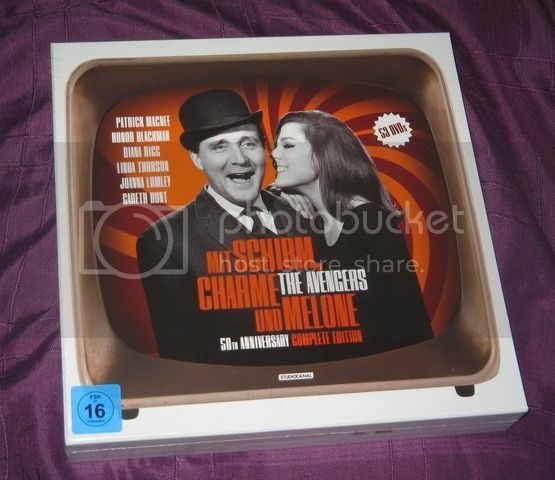 That was the pic I saw on Amazon german site too but where does it say 50th anniversary? In other good news - I was not double-charged tax, since I'm in the EU the German sales tax covered it (it's the same as the UK rate anyway). I am so happy. I just got my UK Amazon Avengers DVD set. Now the trick is how to rig my DVD player to be multi regional. This just makes me want to make another trip to England when I look at the Avengers. The best show ever! I looked up the region code to unlock my dvd player so that it is region free. I thought i was following the instructions but no luck. can't play these DVD's! I read online that sony is notorious for being difficult to unlock. Has anyone had luck with Sony? I have an old sony DVD and a blu ray and neither one work. It so so frustrating. Only thing left is to buy a multi regional player. Also how does everyone deal with taking the DVD's out? Surgery? Does everyone repackage their DVD's? I just don't even see how I am going to get these out let back in! I haven't got the 50th Anniversary set myself but I remember people saying at the time how difficult it was to remove the discs. I think some just removed them all and kept them in separate plastic wallets elsewhere so as not to cause damage. Might be cheaper than buying a new player. thanks Mariocki. I will give that a try. It is the Windows DVD driver that handles regions not the player. Most will allow a limited number of changes though. thanks Nick. So are you saying no download is necessary it will just play on my computer? I will try in any case. VLC Media Player should play anything, and it plays my American (region 1) BBC Sherlock Holmes stories I have no luck in playing on my TV-connected DVD player. But to be honest, DVD players are so cheap now that getting a region-free one should be easy (especially a second hand one via Ebay or the like) so if you prefer to watch on TV instead of on a computer screen, that option should be possible too (and sell your Sony one!). well that sounds like a good idea! Appreciate it! I think I will just have to move to England to watch these DVD's! My PC is blocking playing the DVD's. This is torture! Here I finally got Cathy Gale and Ian Hendry episodes that I have never seen before. OK sorry for the Avenger rant. I feel your agony, anti. I am a huge Sherlock Holmes fan, and frustratingly the British state broadcaster, the BBC, only let its wonderful 1960s Sherlock Holmes series be released in the USA. So I bought the disks and haven't been able to play them on my DVD player. I was able to play them on my computer - by setting my DVD drive to play Region 1 DVDs - but this means that I can't play any of my UK disks on my computer. Crazy, especially as they don't want to release the series in the UK, so it's not as if they're losing any money from multi-region players/buyers of these disks. It makes me annoyed. Region-protected disks are a huge anachronism. A lot of the time, you can't get them in any other region anyway, so the entire "reason" for region coding is rendered ridiculous. You've got the disks, though, so that's a big part of the battle won; and if it's your computer then I'd say just buy a new cheap DVD player (check online for dual region ones). Most modern tellies (on either side of the Atlantic) will accept both PAL and NTSC input, the British and American picture standards, which has been a life-saver. I've been able to watch US disks that are region-free (but not using the UK's 625-line PAL picture standard), like the wonderful Jeremy Brett "Three Musketeers" from the 60s - another British program ludicrously unavailable in the country it was made in! They look far better on a TV than on a computer, anyway. Just get a decrypter like AnyDVD - see videohelp.com - then you can play any region legally. How crazy is that to hear you can't even get DVD's from shows produced in your own country? just crazy! This is one of those Mrs. Peel you're needed moments! I really appreciate both of your comments. I am going to check it out. As you say in the end this will be a lifetime obsession! And loving it!